WooCommerce product bundles plugin let you sell multiple products together in a bundle. You can add simple, digital and variable products in a bundle. Enable fixed price or product based pricing for the bundle. You can make the products mandatory or optional in a bundle for customers. Set the quantity of each product, you want to sell in a bundle. It allow your customers to purchase bundle of similar or various products in one go. Add multiple products to create a bundle and sell all together in one go by using WooCommerce bundle plugin. You can create special offer for customers by combining the various products. You can set quantity of each product to sell in a bundle. WooCommerce products bundle plugin allows you to search and add specific products in a bundle. WooCommerce bundle products plugin plugin allows you to set a fixed price for each bundle or enable product based pricing which displays the sum of prices of selected products. You can enable customers to choose the quantity of products available in a bundle. WooCommerce bundle products plugin let you add simple products and variable products in a bundle. WooCommerce bundle plugin allows you to set the minimum and maximum quantity of products that customers can buy in a bundle. 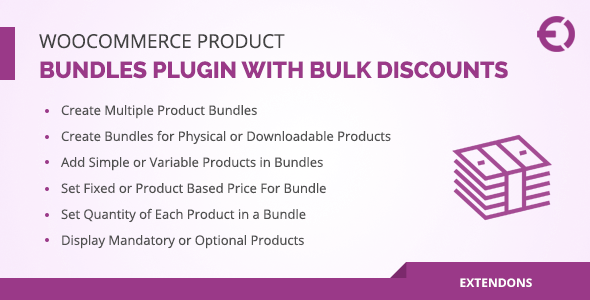 WooCommerce product bundle plugin allows adding mandatory and optional products in a bundle. Customers can have a choice to leave the optional product but mandatory products can’t be left. No matter if you have digital products, you can still create a bundle. WooCommerce product bundles plugin provides flexibility in creating bundle for both physical and digital items. WooCommerce product bundles plugin allows you to add the title and description of products that are added in bundle. This information displays on product bundle page and customers can know the product easily. WooCommerce bundle plugin enables “List View” and “Grid View” buttons on product page. Customers can opt to list or grid view of products containing in a bundle. 1) Issue fixed with custom product variations. 2) Quantity of products do not add to carts as user define when we add min and max quantity. 1) Initial release of plugin.